The 10K, which is nearly all off road is the first event on Saturday morning. It is the ideal course for all level of runner. 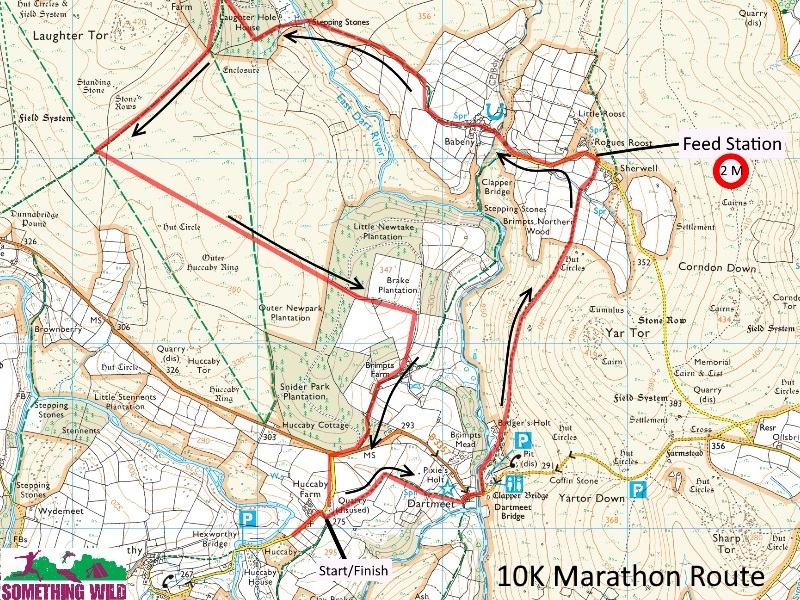 The route follows most of the initial loop of the marathon course, crossing the fulcrum of East and West Dart rivers before ascending towards Yartor, Babeny and Sherwell farm but does not go as far north as Bellever. You will return through Brimpts farm. From here it is a half mile sprint mainly down hill to the finish at Huccaby farm. The cut off time for this event is 2 hours. The 5k will start alongside the 10k but runners will split at Dartmeet and head right to Sharptor and back along the ridge and back towards Dartmeet adjacent to the road. Registration for the 10k and 5k races will be open on Friday evening from 6pm to 7.30pm and from 8.00am to 9.45am on Saturday morning. Here is a map of the 10K route. You can also view the embedded Viewranger map at the bottom of the page. The water station is by the style at Sherwell at approx 2 miles.